What started in the 1980's as a fad after the popularity of the movie The Man From Snowy River has persevered into the 90's. The Australian stock saddle with its distinct knee rolls and lack of saddle horn has proven itself to be a contender not only in the Outback, but in the trails in the US of A, too. This import from Australia has proven to be as popular with Americans as their Australian Shepherds and Heelers. Because the tack is good looking, tough and functional, it has captured not only the imagination of riders, but their respect as well. Those who ride these saddles are swear by their comfort and durability. In fact, it is very easy in America to find a pickup with a Australian heeler dog in it attached to trailer with a mule or horse with an Aussie saddle heading for the trail head. Just like its distinctive look, the Australian stock saddle has a atypical history. Since Australia was designated as a penal colony by the English, it was settle over two hundred years ago by convicts and prison guards sent to control them. This sturdy saddle was, in fact, designed for rugged, unexplored territory to keep the convicts one jump ahead of the police who were in hot pursuit. The fugitive criminals often stole horse and saddle during their escape. The hunt saddles brought from England fell far short of providing stability and security for the fleeing outlaws. Consequently, the saddles were soon modified to include the hunks of leather sewn which evolved into the knee pad or Apoley for which the Aussie saddles are known. Adopting the name A convict saddles, these saddles eventually were made with a deeper seats and higher cantles to add even more security for the rider. Eventually, even rear thigh pads were added. As the convict saddle took on its character and became more accepted, saddle makers began to consider the effect of the saddle on the horse. Thick pads covered in serge to sweep away sweat from the horses body became the norm. An air chamber was designed to keep the saddle from touching the back and soreing the horse. Eventually, the air chamber became wider and deeper. 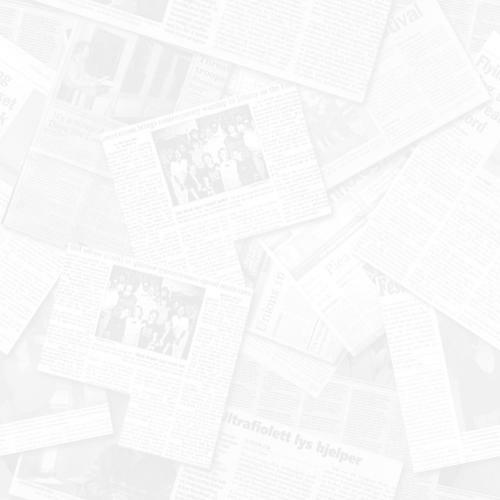 Consequently, no portion of the saddle rested on the withers or the spine. So evolved the Australian stock saddle which was used by ranchers and trainers. With the popularity of the stock saddle in the U.S., modifications needed to be made for both the American horses and the American riders. Australian horses were Thoroughbred types, thinner and in shape. American horses were of wider breeds, better fed and less in shape. Consequently, saddles made for export to the U.S. were designed with wider trees to accommodate the less used and better fed horses. In addition, the rear thigh pads were not popular. They tended to leave less room for the better fed and less in shape American riders. So they were dropped on most saddles destined for the United States. These rear thigh pads are still optional and certainly keep the rider in place during trail riding and bucking sessions. 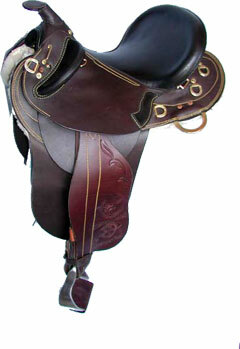 Of course, the most noticeable difference in the stock saddle from the western saddle is the lack of the horn. When working cattle in Australia, the stockmen do not rope the cattle. They work them with whips and, therefore, have no need for a horn around which to dally a rope. Americans, however, couldn't seem to do without the horn to grab onto in a panic situation. The horn provided a visible security and they wanted it at least as an option. Consequently, saddles made for export were made available with a horn. Although the horn is not strong enough for dallying a calf and warned against, it still can hold a horn bag for trail riding and be available as a handle in case of loss of security in a panic. For those who opt not to have a horn, a A monkey grip can be used. This is a strap attached to the pommel of the saddle. It can be grabbed for added security. 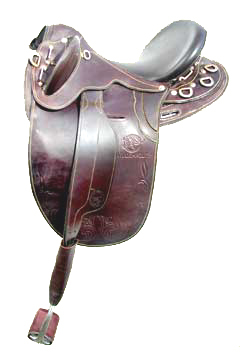 The Australian Stock Saddle became popular in the U.S. for trail riding for a number of reasons. First, its security made it attractive to those who rode rough terrain. Second, it found favor with women riders because it is light and more narrow to sit. It also became a popular saddle for endurance riders. Even ranchers and trainers have given it a try and like it. Of course, there are draw backs to the Aussie saddle. One, obviously, is roping. Those styles without a horn are useless and those with a horn only have horns that decorative. Usually, this warning is stamped on the saddle itself to keep someone from having a bad accident. Another area in which this saddle falls far short and so may the rider, is in English jumping. While it is certainly fine for jumping creeks and small logs, it would interfere with the rider in jumping great heights. It certainly would be a disaster in Equitation over fences. The trees of stock saddles can be made of fiberglass with a steel gullet or steel reinforced wood. Of course, custom fit trees are available. In fitting the Australian saddle, view the saddle from the front of the mule. The padding should be in full contact with the mules back and the gullet must clear the mules withers. Stuffing in these panels can be of many different materials from natural to synthetic. True diehards, however, prefer cowhair or horsehair for superior fit. Pay attention to the position of the knee pad. The more angled back, the more security it provides the rider. These take little getting use to and generally never touch the leg unless needed. In addition, most stock saddles are equipped with attachments for cruppers. And, the traditional stirrup is the oxbow type. In terms of fitting the rider, this saddle should bit snugly, not too tight and too roomy. The rider's height and weight also influence the correct fit. These saddles are not accepted in the show ring, but you can't beat them on the trail.